Sea of Thieves - Friends Play Free This Week! Love Sea of Thieves but haven’t yet convinced your friends to don a peg leg and set sail for adventure alongside you? This may be the perfect time to convince those landlubbers to embark, thanks to Friends Play Free – a week of free access for new crewmates chosen by you, our loyal pirate players! To get your codes, simply visit the Friends Play Free page and ensure you’re signed in and have joined the free Sea of Thieves Insider Programme. Each code can be redeemed on the Xbox or Windows 10 Store for access to Sea of Thieves for the duration of the promotion – plenty of time for new pirates to get their sea legs and find out what all the fuss is about! These voyages not only offer handsome rewards and the potential to snag some dapper Mercenary cosmetics, they also provide a good tour of the Sea of Thieves experience. Use these as a stepping stone towards the madcap adventures that Sea of Thieves players are known to create, literally showing your friends the ropes as they go. This is one of gaming’s most welcoming communities, so let’s bring even more adventure-seekers into our pirate paradise! 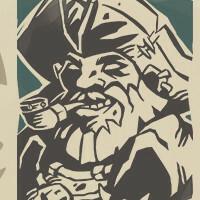 Pirate veterans can be reminded of the joy of sailing for the first time and earn some coin by taking part in Mercenary Voyages, while newcomers get to plunge into the unknown with good company and a guiding hand. Alternatively, if you never picked up Sea of Thieves for yourself, now’s a great time to politely wave a cutlass at friends and find out which of them has a code to spare. Jump straight into the crew experience and get familiar with the pirate life, ready for March 20th – the one-year anniversary of launch day – when we’ll have some more news to share! For more information on how to claim and redeem codes, visit our dedicated Friends Play Free page. Remember that Xbox Live Gold is required to play the game on Xbox One, and you must have joined the free Sea of Thieves Insider Programme to claim your codes. See you on the seas!